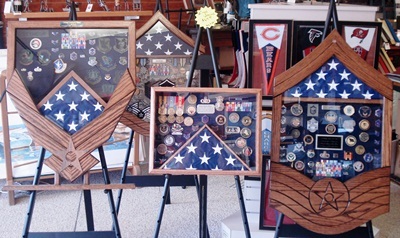 We are a family/veteran owned and operated Custom Picture Frame Shop in Yorktown VA. We also carry a variety of gift items sure to please everyone! Deb's Picture This, Inc offers a large selection of mouldings, quality mat board to suit every project, a full line of H&K Steel Sculptures, Hartstone Pottery, El Paso Pottery, Murano Handblown Glass, stock and custom mirrors and a variety of wares from local artists. We also have in stock military type shadow/flag boxes or will be happy to assemble yours! We carry a variety of shadow boxes, flag boxes, coin displays and sports memorabilia display cases. We will also build your shadow box for you! Variety of sizes and types! See More Examples of Our Work! Sign in on our Contact Us page with your email address to receive special offers and discounts! Special discounts on custom framing: 10% off for all Military ID card holders and as our way of saying Thank You...all customers receive 10% off after your third custom order! Closed Sunday, Monday, and the last Saturday of each month.